The last and arguably finest collaboration between the Three Dragons (childhood buddies Jackie Chan, Sammo Hung, and Yuen Biao). This is fundamentally a Jackie Chan vehicle besieged by the usual thrills and spills. 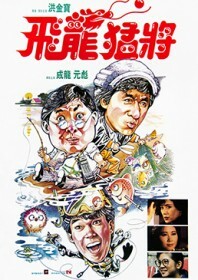 Emphasis is firmly placed on the romantic and comedy aspects, with Jackie and Sammo handling the dramatics well with their suffering partners Pauline Yeung and Deanie Yip. But Yuen Biao steals the show as a hilariously neurotic burglar full of inane words of wisdom. Chan is a womanising lawyer who enlists the help of his brothers to investigate the women involved in his next case. Pauline Yeung’s fish hatchery is being contaminated by twitchy, cigar-chomping factory owner Yuen Wah, and one is suing the other. It’s later revealed that Wah is a drug-smuggler, too, so the action-packed finale sees the Three Dragons invade the gangster’s compound and do battle with the villains in true breakneck style. Jackie’s legendary rematch with Benny “The Jet” Urquidez is almost as impressive as their first encounter in Wheels on Meals. Despite rumours of ill feeling on set, there is no doubting that the resulting movie is true magic and one of Hong Kong’s most enjoyable action comedies.